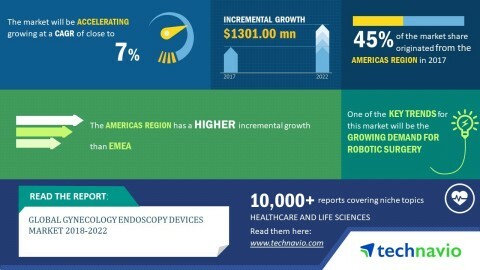 LONDON--(BUSINESS WIRE)-- The global gynecology endoscopy devices market 2018-2022 is expected to post a CAGR of close to 7% during the forecast period, according to the latest market research report by Technavio. A key factor driving the growth of the market is an increase in the prevalence of gynecological diseases. The demand for gynecology endoscopy has been significantly increased over the past few years, due to the rise in the incidence of various gynecological diseases. This has occurred due to change in lifestyle and growing older population. Gynecological diseases also include life-threatening diseases such as cervical cancer, ovarian cancer, and vaginal cancer. According to CDC, every year more than 95,000 women in the US are diagnosed with a type of gynecological cancer and every year, more than 30,000 women die due to gynecological cancer in the US. Thus, the growing incidence of gynecological diseases will increase the demand for devices of gynecology endoscopy. This market research report on the global gynecology endoscopy devices market 2018-2022 also provides an analysis of the most important trends expected to impact the market outlook during the forecast period. Technavio classifies an emerging trend as a major factor that has the potential to significantly impact the market and contribute to its growth or decline. In robotic surgery, robotic assistance is used while performing the operation and the surgeon makes use of a console, which is present in the operation theater. By use of the console, surgeons control the robotic arms which are equipped with a special camera and surgical equipment. The camera then provides images, that are then displayed on the video monitor, which aid the surgeons in decision making. The use of robotic surgery is gaining popularity because it aids the surgeons to overcome the difficulties faced while performing conventional gynecology endoscopy operations. “The advantage of the robotic surgery is it provides magnified 3D vision and an increased range of movement in the body. Also, it helps surgeons to perform complex procedures with higher precision and reducing the size of incisions. Robotic surgeries can help lower the risk of complications for the surgeons,” says a senior analyst at Technavio. This market research report segments the global gynecology endoscopy devices market by product (accessories and others and endoscopes) and geographical regions (APAC, EMEA, and the Americas). The Americas led the market in 2017 with a market share of 45%, followed by EMEA and APAC respectively. The dominance of the Americas can be attributed to the increase in the prevalence of gynecological diseases and growing awareness about gynecological diseases.